Enquire or book a trip along Cần Thơ - Sa Đéc - Châu Đốc - Cần Thơ. Boarding back, complimentary drink as a welcome back on board. The bar services are available; rest on the deck enjoying the sunset. The crew will serve dinner while the Bassac is cruising Mang Thit river towards her anchorage point for the night. 06:30 Departure towards Sa Dec. The passengers take their breakfast while enjoying the scenery on the banks. 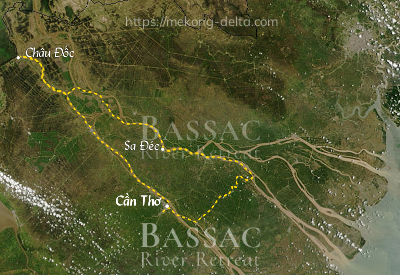 The Bassac cruises upstream Co Chien river along the banks of Ben Tre. The Bassac resumes its trip towards Sa Dec, and crosses the My Thuan bridge. Arrival in Sa Dec late in the morning. End of services by mid-morning on shore at Cần Thơ. 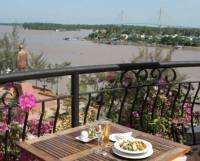 Upon disembarking, you may take a tour of the old market and the Ninh Kiều pier, with its pagoda, then have lunch in Cần Thơ if you have time. The pier has a few good spots to stop for a meal: from the Sao Hôm restaurant, in the old market hall where you disembark itself, to the Nam Bộ restaurant (1 Ngô Quyền, just 300m away), which both serve classic Vietnamese cuisine and specialities, and even some western food for the weary traveler, and to l'Escale (the Port of Call), on the top floor of the Nam Bộ, which serves fine cuisine on a terrace overlooking the Mekong. You may also take a cycling tour to some nice green spots in the surrounding contryside and discover how different Cần Thơ is, again, in the variety of landscapes of the Mekong delta. You may also fly straight to Đà Nẵng if you are going on to Central Vietnam, that will save you hours on the road to Saigon. 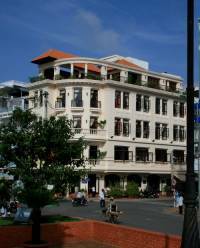 There are daily direct flights between Đà Nẵng and Cần Thơ by Vietnam Airlines and Vietjet Air. Vietjet Air flies by the end of the morning, so you may take the flight after disembarkation.